Posted on March 21st, in News & Opinion. Our voices were heard loud and clear this primary season! 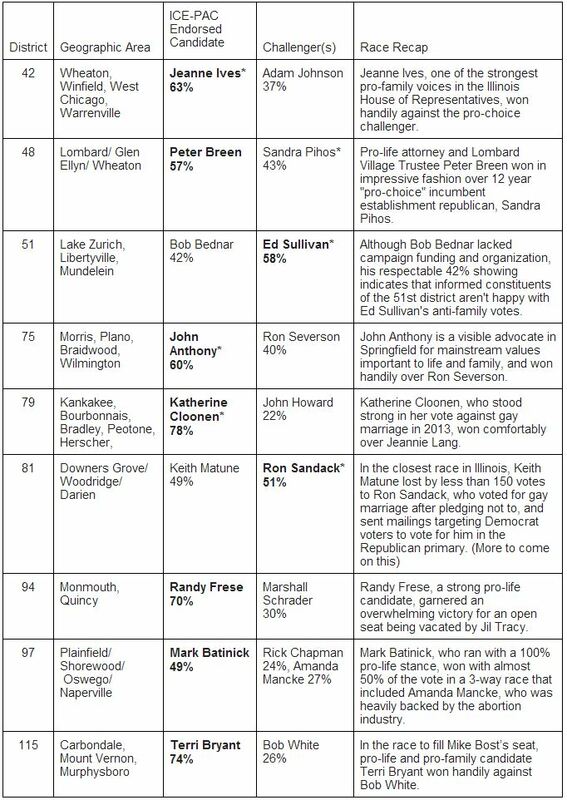 Seven of the nine candidates endorsed by Illinois Citizens for Ethics PAC won in Tuesday’s primary elections for the Illinois House, while another race was decided the following day because it was so close! Thank you for your role in making this happen, through your financial support, volunteer efforts and spreading the word on these great candidates. Illinoisans showed that they turn out and vote for candidates that represent the “mainstream values important for life and family” that ICE-PAC promotes. So, don’t be fooled. The candidates that are visible advocates for policies that protect and promote the family, the unborn, pregnant women, and authentic marriage were the BIG WINNERS. And in turn, the Illinois people won as well. 7 out of 9 ICE-PAC endorsed candidates won. We knocked off a pro-abortion incumbent of 12 years. We had a major role with our fundraising and activism in mobilizing volunteers and community support. We almost knocked off a pro-gay-marriage incumbent – lost by less than 150 votes. Overall a great day for anyone who believes in mainstream values important for life and family. Your support matters! These candidates did not do it alone. They had help from organizations like ICE-PAC, who encourage them to take a conservative stand on social issues, while defending them from attacks from liberal candidates and organizations. Thank you for supporting ICE-PAC, the biggest and best grassroots pro-family political action committee in Illinois.